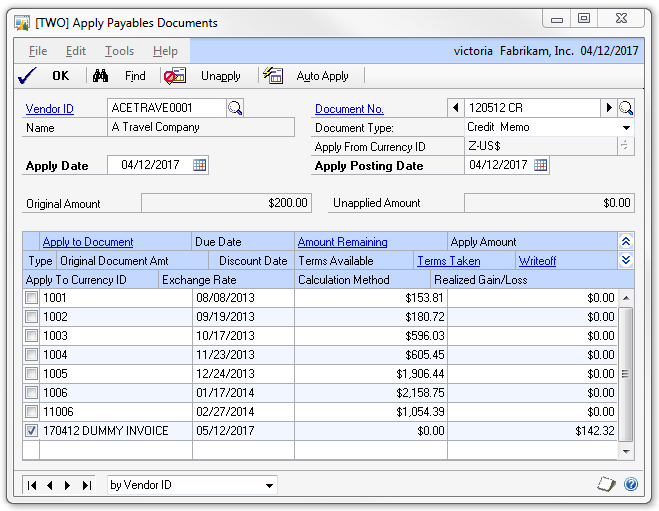 Periodically I get calls or see questions online about how to void a partially applied Payables transaction in Dynamics GP. This is one area where the Payables module differs drastically from the Receivables module and you have to jump through some hoops to actually accomplish this. That should do it on the Payables side. Depending on your settings, you might have some General Ledger postings to complete from transactions this generated. 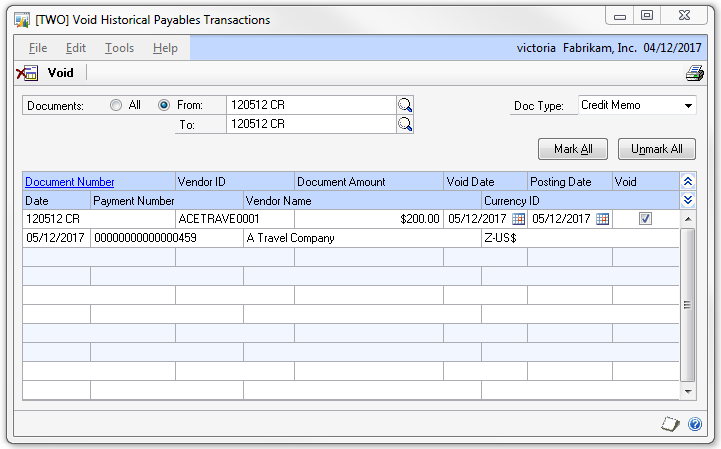 Now you have a reference for the steps to follow next time you have to void a partially applied Payables transaction in Dynamics GP. I am having an issue where I have a credit memo I am trying to apply to an open invoice, it gives me the message “Only the remaining balance can be applied.” The real problem is, this credit memo has not been applied to anything. If you go into the Vendor transactions, it clearly shows that it has not been applied to anything. So, now trying to delete the credit memo, it tells me that is has been partially applied or is on hold. So now i am in a quandary, i cannot apply it to any invoice, dummy or real, but I also cannot delete it. You can try check links and reconcile to fix this…not sure if it will. 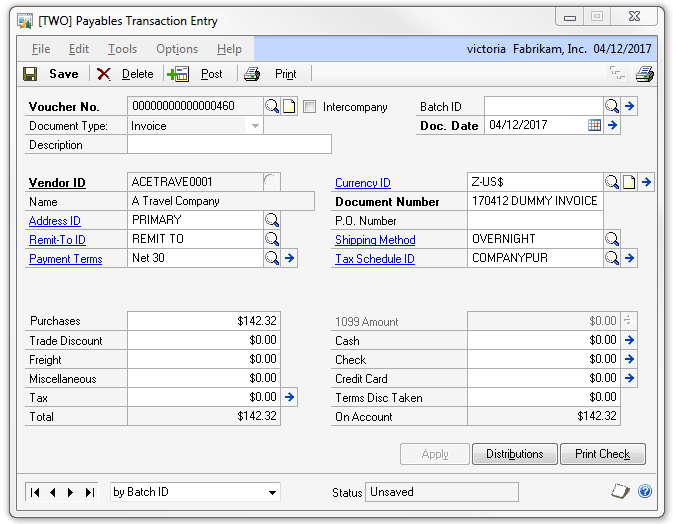 I have used this procedure to kill partial fill payment, but when I try to apply the dummy invoice, I can’t see open payment. Can anybody tell me why? It’s very difficult to tell what you’ve done so far and what step you’re on. Can you please give some more details? A GP PO was split into two shipments by our vendor and received separately (receipt A and B) on two separate days. We are trying to correct an invoice that was mistakenly applied to both receipts (receipt A and B) instead of just the one (Receipt A) that was applicable. The invoice was paid and the payment posted (with quantity of A+B but only cost of A.) We tried to void the historical payment and then return the invoice. However, the inventory was already consumed (for both receipts) by the time we were notified of the error, and we are unable to select the receipts for return. We now have an invoice for Receipt B that needs paid but has no receipts available. Do you have any ideas on this? Thank you! It’s very difficult to advise a proper course of action without looking at all the transactions, GL distributions, what’s been voided, etc. However, it seems that the simplest thing to do would be to enter a payable invoice (without linking it to a receipt) for the remainder of the payment due to the vendor. The GL distributions for this would greatly depend on all the other entries already made, so I cannot speak to that. You may also need to make some adjustments to the inventory cost of goods booked, and possibly other changes if you are using average costing. Again, to truly clean this up properly you would want to work with someone (perhaps your GP partner) that an look at all of this and advise the best solution based on what is in your system currently. I have a question about manual cash payment processed in GP. We processed 2 payments using the manual payment application in GP. However, these two payments were posted in the wrong month, so we have to voided them. My question for you is, normally when we void a check, the checks disappear from the bank application. We have to use the Reconcile Bank Statement application to mark all of the payments (checks and wires) that cleared the bank each month. However, these two payments still remain there even though they were voided and when we tried to mark them, GP doesn’t allow us because they are voided. But when we print the outstanding transaction check report, the two voids are still showing as outstanding. Any suggestions as to what can be done to remove them from the outstanding report so we can balance? It sounds like something may have gone wrong in this case, so it may be better if you have someone actually look at your data to determine what happened and the best way to fix it. Either your GP Partner or Microsoft support should be able to help you with this. I have an invoice stuck in Open status. Multiple credit memos were applied to it, leaving the remaining amount 0, but it won’t flip to history. All of the credit memos are also open, even though 2 of the 3 were fully applied. I tried checklinks and reconciling purchasing, but that didn’t work. Is there a way to push these through? Thank you. Most likely the fix for this will involve updating data directly in the SQL server. Unfortunately there is no generic script for this, it should really be done when looking at your data. I would recommend working either with your GP Partner or with Microsoft Dynamics GP support to get this cleared up. Hi, maybe you can assist me with a very strange situation. I have an invoice that was fully paid by a payment but was still showing Open status. The payment was voided but the apply link between the 2 was not removed by the void. I ran checklinks: it found a problem with the invoice status, updated the invoice to history status. Now both payment and invoice are in history; but they are still linked by the “apply”. The invoice should be open again since the payment was voided. A new payment was created to pay the invoice, but it can’t be applied as the old voided payment is still fully applied to the now historical invoice. Neither can I void that historical invoice. It sounds like you’ve had a combination of things go wrong with this set of transactions. Unfortunately, to help with this would require looking at the data in your SQL tables. It’s just not a standard situation that has a generic answer. I would recommend working with your GP partner or Microsoft Dynamics GP support to resolve this. I am having a similar issue, except the transaction that is giving the error message is an open INVOICE, not a credit. Originally, I had entered this invoice, and marked it as paid using one of our credit cards. Later on, I figured out that it was in fact paid with a different credit card, so I went and voided the open invoice for credit card vendor #1, as well as the historical payment. Unfortunately it won’t allow me to complete the 3rd and final step, which is voiding the original “open” invoice. (I got frustrated and in the mean time, I started over from scratch and entered a new invoice, marking it as paid with the correct credit card). Unfortunately, I am still left with this open invoice to the original vendor. I have even tried entering a credit memo for the same amount, but when I try to apply the CM to this invoice it says the document is already fully applied. Any suggestions? Since there have been so many transactions and voids, I am not sure that I have a clear picture of what the statuses of all the transactions are. I would recommend working with someone that can take a look at your system together with you to help clean this up. Enter a manual payment for Vendor B, pay it with Credit Card C – this will pay off the invoice for Vendor B, resulting in an open invoice for Vendor C.
You can also put a note on the original invoice for Vendor A recording what happened. This is typically enough in case you need to see what happened later.